Many biological molecules of interest naturally fluoresce when excited by shorter- wavelength UV light. This intrinsic fluorescence can be a powerful tool. One important application is the direct fluorescence imaging of aromatic amino acids including tryptophan, tyrosine, and phenylalanine, which are building blocks for proteins. The aromatic rings in these molecules exhibit strong fluorescence excitation peaks in the 260 to 280 nm range. 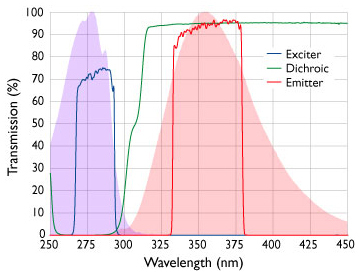 Because the fluorescence is intrinsic, samples can be observed without the added chemistry and limitations associated with "indirect" labeling by extrinsic fluorophores. Another important application is DNA quantitation. Purines and pyrimidines – bases for nucleic acids like DNA and RNA – have strong absorption bands in the 260 to 280 nm range. Semrock's UV BrightLine® fluorescence filters offer a powerful tool for practicing direct fluorescence imaging. These unique UV filters are reliable and offer performance nearly comparable to that of visible and near-IR filters. 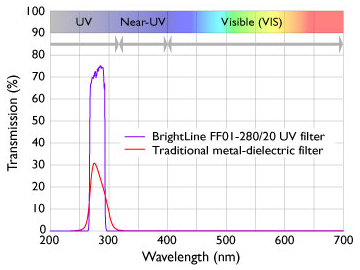 The left figure shows the spectrum of a high-reliability 280 nm BrightLine excitation filter with the highest commercially available transmission (> 65%), remarkably steep edges, and wideband blocking across the entire UV and visible spectrum. This spectrum is directly compared to that of a traditional metal-dielectric filter. In one example system, this filter difference was shown to provide over 100x improvement in signal-to-noise ratio.